Inspiration Corner: Monet says ... forgettaboutit! 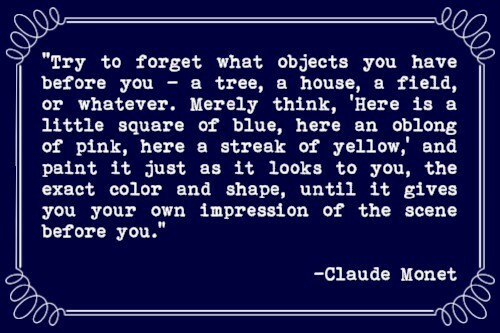 This week we're going to start things off with a quote by French artist Claude Monet, and how you can work his sage advice into what you make. OR if you're not the creative type - then it will still help you when observing the work of others, and while snapping photos with your phone. Do you remember when you were a child and did just this? 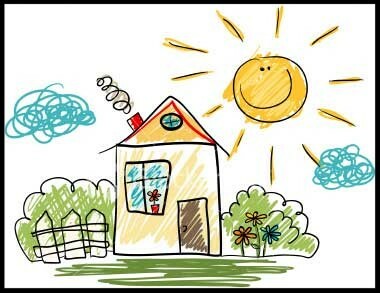 A house you were drawing consisted of a square (the house), a triangle (the roof), some rectangles (chimney, door, windows), a circle (the sun), big fluffy things for the clouds, bushes & leaves on a tree etc. Nothing fancy - but if you think back to that drawing you did as a child, then you will get a much better idea of what Monet is suggesting. Whether you create quilts, jewelry, paintings, drawings, photographs, prints, pottery, collage etc. - really "getting" this is what will help you simplify & refine what it is you're attempting to make. 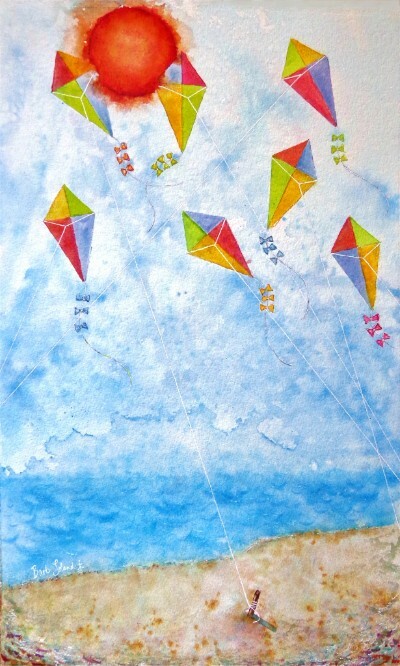 Here's an example of one of my paintings that's composed of basically 2 main shapes - the triangle & the circle. Take a look at how childlike & joyous it is! Learning to see simple shapes in what you're looking at will make a world of difference when you go to you snap a photo, design a quilt, create a collage, cook & serve a delicious meal, or design & update a room in your home - among others. The simplicity of shape matters.